September 10, 2018 (Last Updated: April 9, 2019) - As an Amazon Associate I earn from qualifying purchases. Apple pie flavors without all the hooplah! 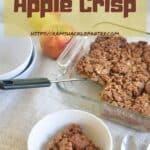 This Easy Apple Crisp recipe is a delicious dessert anybody can make. This is really simple and if you want a no-fuss dessert, give this recipe a try. Apple Crisp is a recipe for the people. It is so simple, but still so tasty. If you have a tough time making crusts or don’t have any crusts on hand, this might be the recipe for you. Honestly, there really isn’t much to Apple Crisp and that is the beauty of it. As long as you have some apples and a few other common ingredients, you can make a top shelf Apple Crisp in no time. Enjoy our recipe in this segment of our apple pie series! Imagine a perfect traditional apple pie. Now, take just the guts of that apple pie and put that on a plate. Then, add in a beautiful oatmeal streusel topping to it. Bingo, bango, bongo… Apple Crisp. Apple crisp is an easy version of an apple dessert that almost anybody can make with common ingredients from around the kitchen. 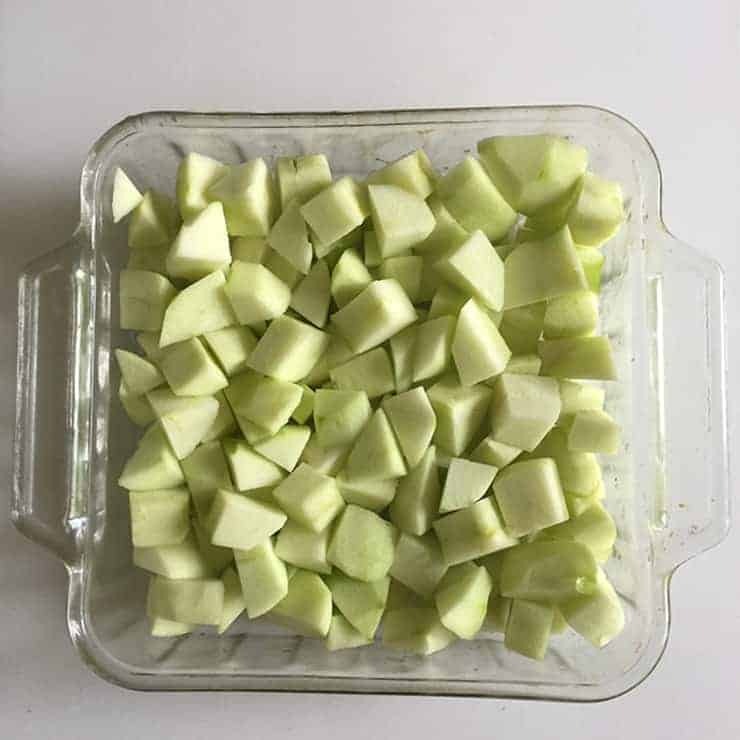 Like the other recipes we have shared in our apple series, we are sticking with two different kinds of apples that I think would be good for apple crisp. Braeburn and Granny Smith apples. For this particular recipe, I am using granny smith apples. Granny Smith apples keep a nice, firm texture and are sweet enough. Sure, they tend to be tart, but remember that we are adding a boatload of sugar to this dessert. Granny Smith Apples will work just great. If there is any nuance to an apple crisp, it is the butter. In a traditional apple pie recipe with a butter pie crust, we want the butter to remain whole. When the butter cooks in the flour, it evaporates and creates that flakey texture and test in the pie crust. We don’t need that in our apple crisp recipe. In fact, I learned a lesson. I tried to use butter how I have been using it in the pies and it only caused problems. For our apple pie crust, we use a butter crust that calls for putting the butter in the freezer. 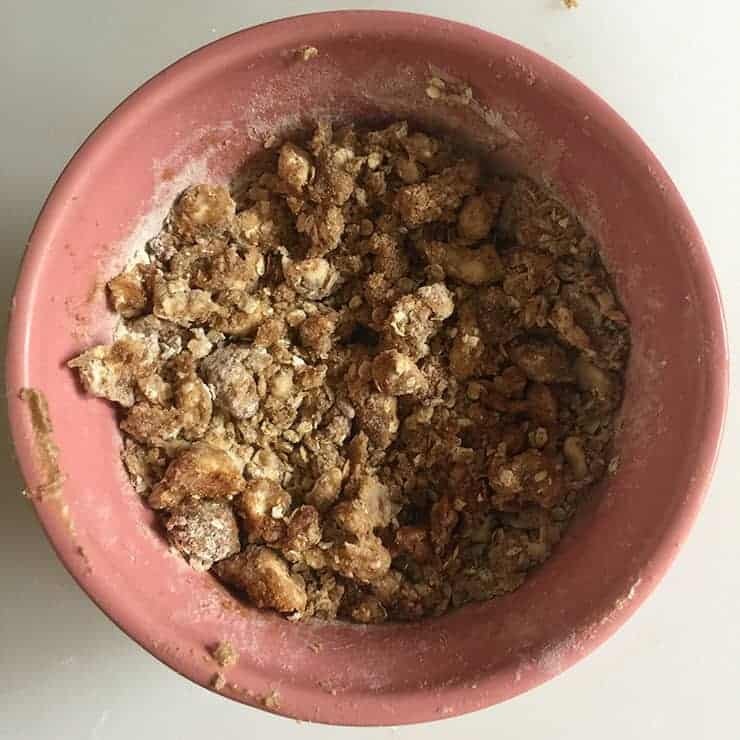 For this recipe, however, we are softening the butter and mixing it in with our streusel topping. Softened butter is probably one of the most important parts of this recipe. While I think ice cream is great for most apple desserts, I think it becomes a bit more important in our apple crisp. I think a great apple pie can rely on the crust to bring a delicate and interesting flavor and texture to the pie. With apple crisp, however, we are beating people over the head with the apple and I think a nice creamy ice cream can balance that flavor and texture. 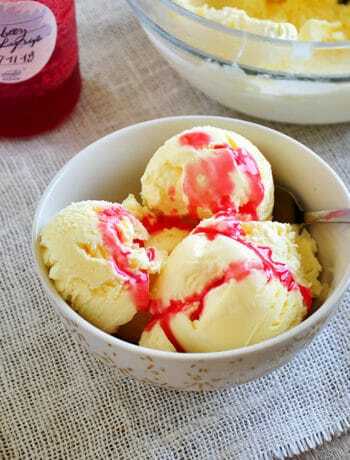 Here is a link to my simple Vanilla Ice Cream recipe. Overall, I am a big fan of apple crisp and it has been a fairly regular dessert in our household for several years. To be honest, we have an apple tree in our yard and we end up looking for ways to use all the apples. The apples are fairly tart, but this recipe allows us to easily and handily use the apples from our tree. If I don’t go pick them, they drop to the ground and then I have an abundance of rotten apples AND hornets. That is no fun. 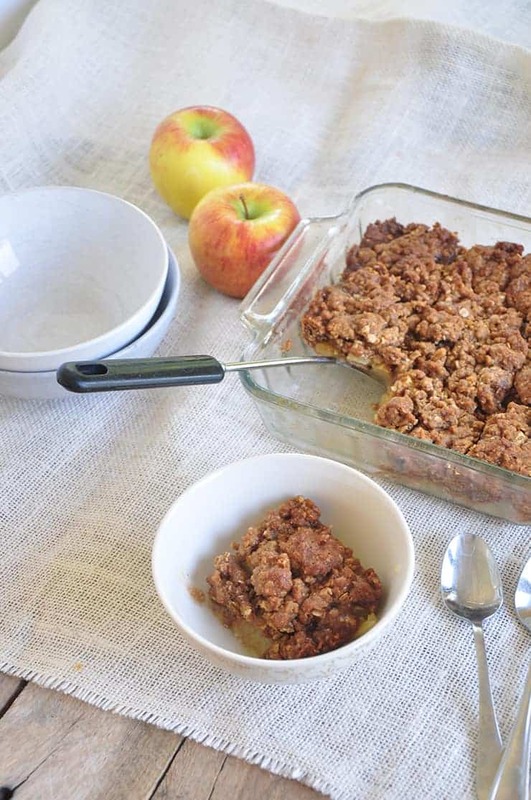 Enjoy this recipe and make a beautiful apple crisp today! Don’t forget to subscribe to get emails and to follow me on Instagram. Apple Crisp is a fruity, easy, and delicious dessert. Don’t have the time or energy for fresh pie crust? Give this super simple recipe a try to quench that sweet tooth! Bake for 40 minutes. Check to see if apple mixture is bubbling. If it is and the apples are easily pierced with a fork, the apple crisp is done. If not, repeat for another 5 minutes and test again. Apple Crisps is such a perfect fall dessert! Love how simple this is! How nice and delicious. 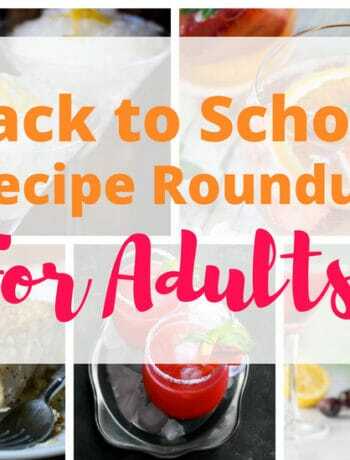 Perfect for this time of year and I love that you used tart Granny Smith’s to start the recipe. This looks really good! So yummy! I like this! Thank you for a great recipe! I think what you call apple crisp, I know as apple crumble — I love how traditions and names for things are different across the world! I love this kind of simple tasty food. 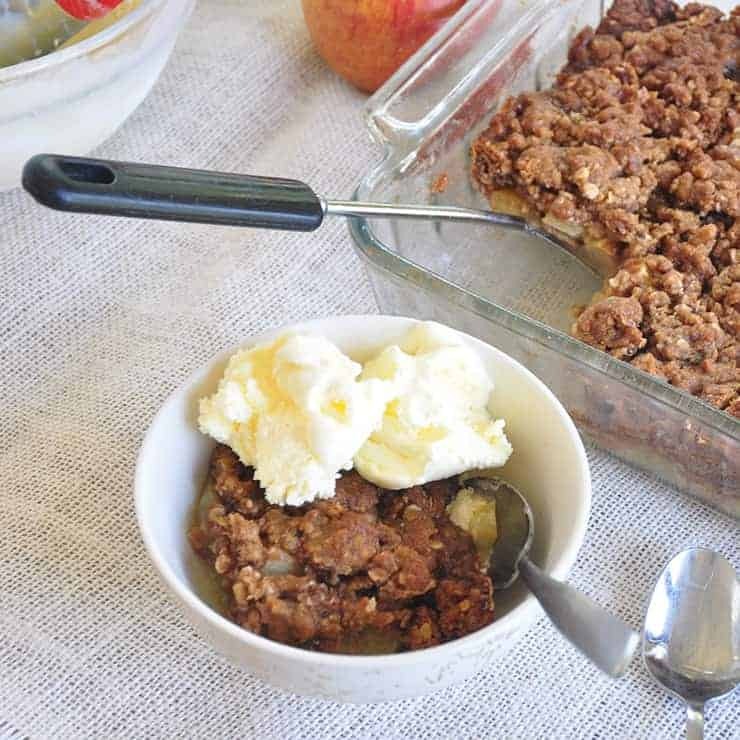 Nothing like a classic apple crisp… even better when made so simple! THanks for sharing. Sometimes I pat a very, very, very thin layer of the topping onto the bottom of the pan, and then proceed as usual. 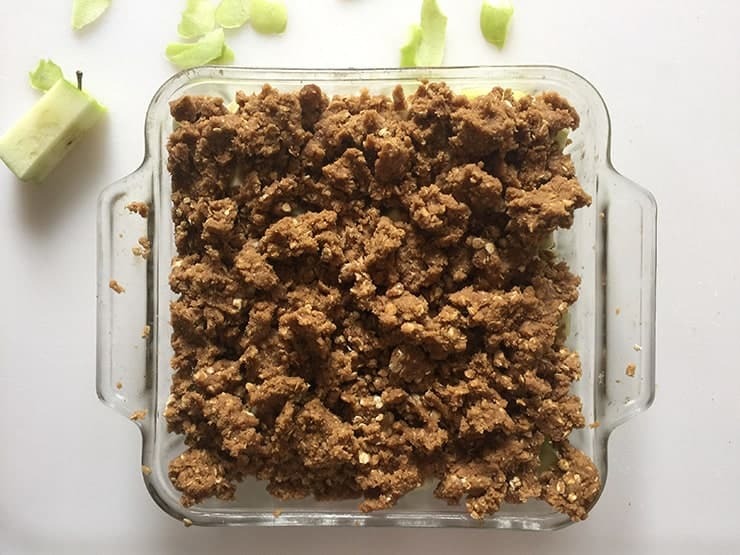 It caramelizes and makes a really fun crisp.